I was brought up in a home where there was always sewing, and Gran used to come and stay with us in the north of England, in the spring and autumn, to help my mother make clothes for the next year for me and my twin sisters. It was always said that as a young child I couldn’t sit still long enough to sew, but before leaving junior school I was introduced to weaving with straw plait, making trays, wastepaper baskets, and shopping baskets from cane. My foster sister remembers how every holiday I took over the bathroom, so I could have the cane soaking in the bath! Following a traditional grammar school education, I wanted to undertake a practical training to become a teacher, and studied Textile Craft, which covered hand embroidery, traditional dress-making techniques, simple printing and dyeing, but unfortunately nothing at all related to patchwork. In 1989, following a visit to the 1st UK Quilts show in Malvern, my life changed when I was bowled over by the interesting use of fabric, and the wonderful quilts which were being exhibited. 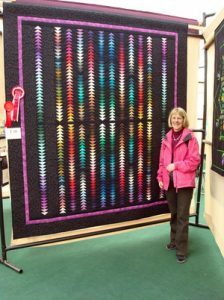 At this show I met Jackie Taylor, of White Cottage Country Crafts, who was advertising ‘Make a Quilt in a Weekend’. As I taught full time in a challenging comprehensive school in Bridgwater, the idea of making a quilt in a weekend held great appeal for me. I remember after work driving on a dark, wet, November evening into the wilds of south Wales to Gelli Fawr, where I was introduced to the amazing world of rotary cutting. I found it a wonderful relaxation having time to sew without interruptions, and although the double quilt was not made in the weekend, I had completed the main blocks so I could ‘flip and stack’ to take the pieces home and join them later. I had really enjoyed my introduction to rotary cutting and speed piecing and drove home wondering who else I could make a quilt for! I have 5 wonderful nephews who, over the years, have accepted the offer of a quilt as a special present and have been involved in discussions about the design and colours of each of their quilts. I generally make bed quilts as wedding presents, or mini quilts for the great nieces and nephews. Since 1989 my aim has been to make a quilt a year, and I have enjoyed many of Jackie Taylor’s therapy weekends and made bed quilts following several traditional patchwork designs. For example Trip Around The World; Kaleidoscope; Stars on Calico; Magic Lanterns by Lynne Edwards; Sandra’s Quilt by Sally Ablett; or by enlarging a Bargello wall hanging called Fractured Rhapsody by Marge Edie, from a 47″ x 37″ wall hanging into a 98″ x 98″ bed quilt !! The End – The Quilt that nearly wasn’t ! A possible project I had for a ‘Jackie weekend’ in autumn 2008 was to make a Jinny Beyer hanging which had attracted me as long ago as the end of the 90’s, when I bought the basic instructions and pack of squares, but it had remained untouched in the cupboard since then. On my way to Wolverhampton I stopped at Abigail Crafts in Stonehouse and bought some dark fabric for the background and sashing for the hanging. I thought I might construct the ‘geese’ in 3D rather than just cutting one small piece from the 5″ square. Jackie was used to me working on a large quilt, so she suggested that I cut each square on the 2 diagonals, to enable me to make 4 ‘geese’ from each colour. That weekend I started piecing the rows of ‘geese’ and calculated how much extra background fabric I would need for the 600 ‘geese’ – a total soon to increase! First thing the following Monday morning I rang Abigail Crafts hoping to buy the extra fabric needed, but unfortunately they only had a small amount on the end of a roll, so I bought all they had hoping that if I was extremely careful with cutting I may just have enough for the ‘flying geese’. Over the next few months I worked on the strips of ‘geese’, aiming to complete the 10 long strips, each consisting of 60 ‘geese’, to take on my next quilt weekend, in March ’09, to enable me to assemble the top. At about 10pm on Tuesday, prior to the Friday of my luxury quilt weekend, I discovered I was short of background for about 10 ‘geese’ ! I discovered I had a strip from the selvedge giving the name of ‘Wildflower Serenade’ by Moda, so my husband suggested that I search on the internet. I found the range and decided my fabric had to be ‘Midnight’ shade – but ordering from Houston would not bring the fabric in time for the weekend. Totally dejected I retired to bed – to be woken about an hour later as my husband, David, thought he’d found what I needed on ebay. Nerybeth Fabrics of Maesteg advertised 8 fat quarters and David bought them all and requested that, if possible, could they be posted 1st class, as I really needed them to take with me on Friday morning. What Stars – David for finding the fabric, and Sheryl from Nerybeth for sending it immediately, and the package arrived just as I was loading the car on Friday morning. The 8 fat quarters arrived as a 2 metre length, so I was able to complete making the ‘geese’, cut the sashing to go between the strips of ‘geese’, and have a 5″ strip on either side – BUT – the quilt was really not wide enough! Now time to search my stash for 30 more fabrics to compliment the centre panel of Jinny Beyer fabrics, to make two more long strips of ‘geese’ and I discovered that I was short of greens, but thankfully, ‘with a little help from my Brockley Quilter friends’, sufficient was found. The top still only measured 64″ wide x 74″ long, and I really wanted a generous sized double bed quilt, so back to Nerybeth Fabrics. Sheryl managed to find a couple more metres of ‘Wildflower Serenade’ in Midnight, so I could add an outer border and bind the quilt in the same fabric. Now to machine quilt – but how? I like the quilting to highlight the patchwork design rather than detract from it, so I began by stitching in the ditch from the centres out, linking 3 rows of geese in a zig-zag manner. The top stitching along the geese fabric really made them stand out, so I decided that each of the new total of 720 ‘flying geese’ shapes had to be stitched completely. The sashing was stabilised either side by stitching in the ditch, but the 5″ ‘Midnight’ borders still needed some quilting. To complement the rainbow coloured fabrics, I chose a ‘King Tut’ rainbow variegated quilting thread to free machine a large vermicelli pattern. It took a few nights of dreaming of the lines before I embarked on this, but I was quite pleased with the finished result. Now all that was left to do was to bind the quilt, embroider a label, and deliver it to Malvern. WOW ! – I won ! Very many thanks to South West Quilters for sponsoring the award for best traditional patchwork, as it means so much to me. Oh – I almost forgot – I had another bed quilt to make before Christmas 2009 for a special niece who announced the arrival of her first baby in March. Marjolaine lives in Montreal, but as we had last seen her in New Zealand, ‘Kiwi Dreams’ was the quick quilt I made. The baby has now arrived safely, but as yet she and her partner, Robert, haven’t been over to collect their quilt. The plan was for her to visit us around New Year, but unfortunately sickness prevented her from doing so.